The kitchen design is inspired by a traditional English kitchen with a classic and timeless look that is both warm and comfortable. In order to achieve this, I have drawn inspiration from the current great English design kitchen companies, as well as looked to the past and (period piece dramas) to reference details that have lasted through the many years of technological advancements, trends and stylistic changes. I want a kitchen that is both modern in it’s tools as well as conveniences, but I don’t want it to look like the white elephant in the house. I know there is a very fine line that you need to draw in order to have a kitchen that doesn’t feel too needlessly traditional nor inappropriately modern. Figuring out where that line lands is what’s tricky. I tend to lean traditional anyway so it will actually more challenging for me to have it not feel like a period room… of course not exactly, but at least not feel that way to me. 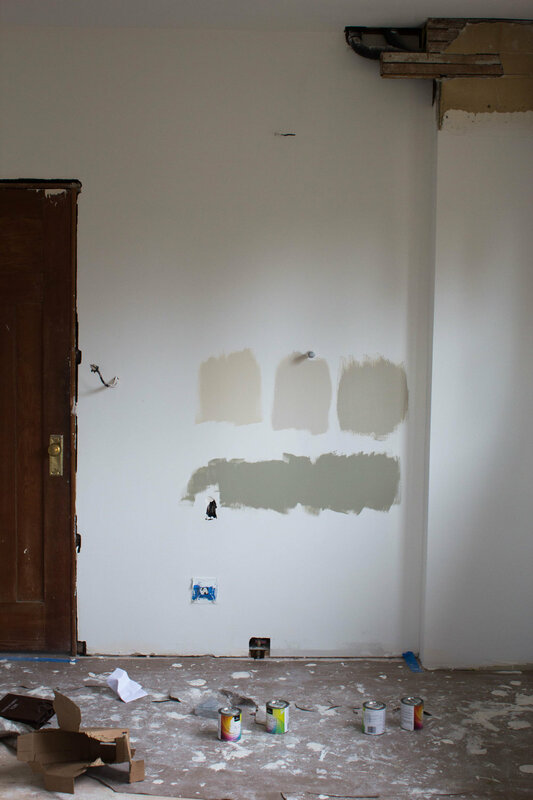 The way in which I’ve decided I can create a clear distinction is for the permanent finishes: like the cabinets, flooring, and windows, along with some of the more grounding elements like the appliances, faucets and sink to be timeless. Other areas where there is more flexibility in terms shifting the mood more modern, are in the decorative furnishings, lighting, and accessories and hardware. We have a budget that we need to stick to, so there is a definite mix of high and low elements. And interestingly enough, the areas where I’m choosing to remain more timeless are also the areas in which I’m investing more of the budget. Whereas the modern less permanent elements can be a little easier on the budget. 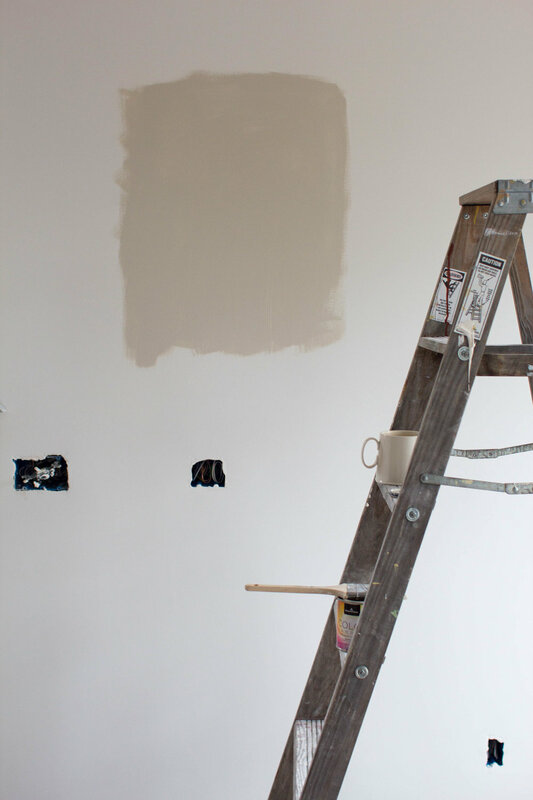 After combing through my inspiration files and pinterest boards, I noticed a few strong themes that which I made sure I would stick to, since this would become the design DNA of the space. 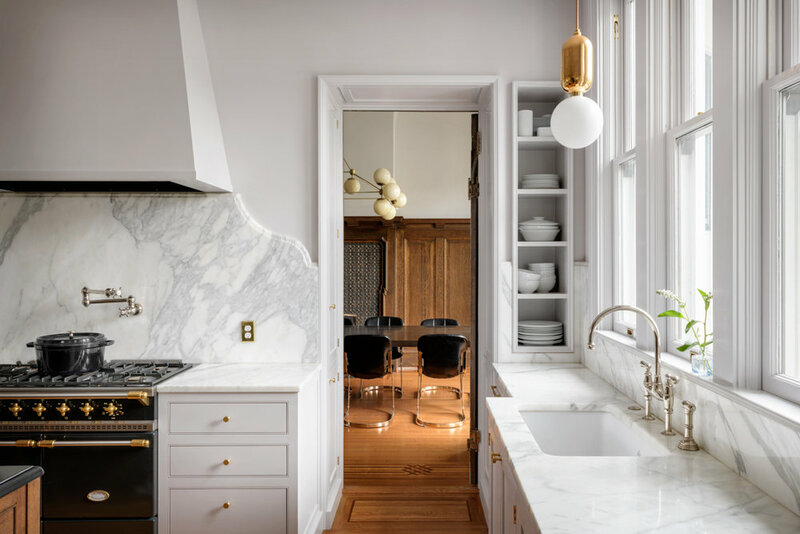 Those themes or design details were: kitchens with color, brass finishes, a mix of lighting, wood floors, stone countertops, inset cabinets and a showstopper of a French range. Specifically for the needs and scale of this space, I ended up saving a lot of inspiration kitchens with built-in appliances and full-length larder cabinets rather than a separate pantry. Also, if you’re wondering: ‘where is Jack in all of this?’ Well he doesn’t really have much of a preference nor does he consider himself much of a cook. He just wanted a space that was functional and in budget, and knew that anything I designed would be more functional than the existing kitchen. 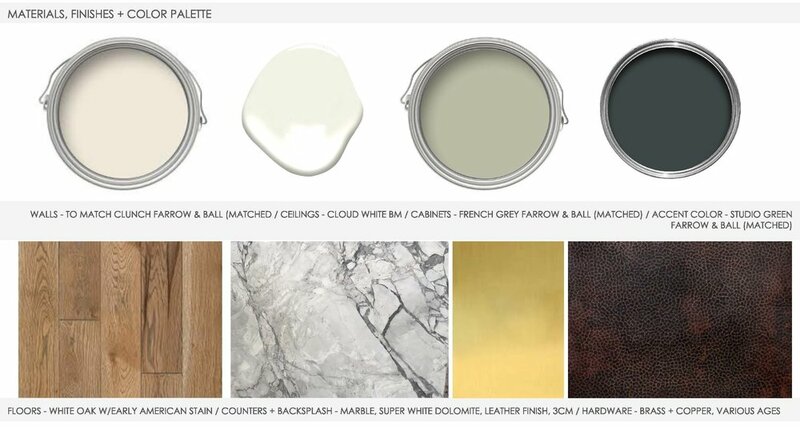 With these details in mind, I created design boards to give myself a clear style guide to reference back to when selecting items and finishes for the home. I also drew up the floor plan of an idea layout and elevations in order to see how it would all come together. The next layer of design involved the details of how each finish would be applied and handled. The range is a very tricky component for example. I wanted to create a statement hood and range focal point in the room, but the wall that the range sits on has a very annoying waste pipe from the toilet and plumbing above that cannot be moved. It also is where the exhaust pipe for the hood needs to exit through. So in addition to a bump out in the corner, there is a soffit that we don’t want to draw attention to. You can see in the drawings and rendering below, I designed a custom built-in hood that will hopefully disguise the soffit slightly as well as the wall that is covering the plumbing. Like I mentioned above the budget is going towards the permanent fixtures in the space. 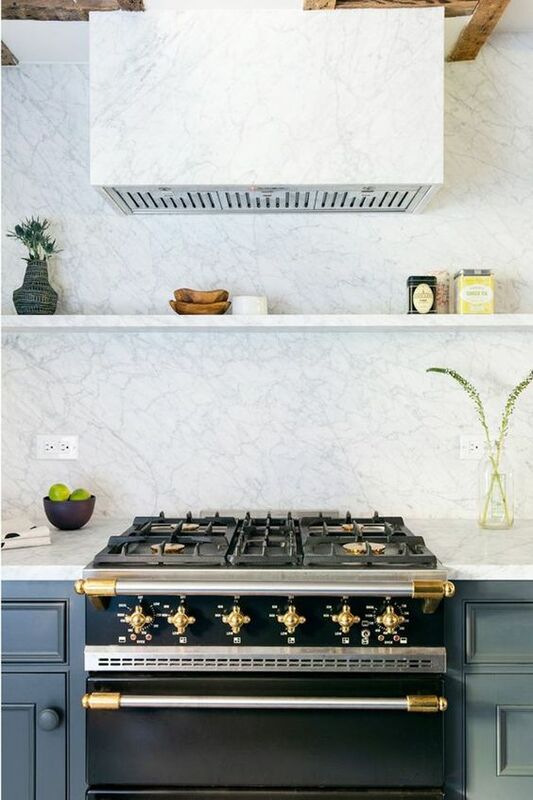 These include the La Cornue range, the farmhouse copper sink, the faucets from Perrin & Rowe and the appliances are: a built-in Bosch dishwasher and panel-ready Fisher & Paykel Refrigerator. The light fixtures were sourced from a several vendors, from Arteriors, to Rejuvenation, School House Electric, Y-Lighting and Circa Lighting. I will admit pulling all the lighting fixtures together is most often the most trickiest part of the design process. It’s definitely a fun part, but challenging to ensure the different finishes and textures will come together. A furniture item that was high on my wish list is an antique French draper table that would act as an island. I searched high and low for the perfect one, but unfortunately the perfect one was not perfect for our budget. I did end up finding a shelving unit/console at the local antique mall that would be a great inexpensive alternative until I have the budget for my dream table. The other design moment that I’m really excited about is the built-in breakfast nook at the end of the kitchen. I have always longed a breakfast nook with a built-in bench. In this house we are lucky to have a nook at one end of the kitchen that has a large picture window facing the east with a view of our backyard and mountains. It is the perfect spot for a wrap around built-in bench. In terms of style I eventually want to add upholstered backs. This upholstery will also be a part of Phase 2 - when we have a little more budget saved up again. I’ve been careful to record the process along the way by photographing the phases of the project as well as creating short videos for my stories on instagram. If you’ve missed anything, be sure to check out the ‘Kitchen’ in the highlights section of my stories on my profile page. Just last week we created cardboard silhouettes of the custom hood (which I’ll talk about more in depth soon) to ensure the scale and depth is right before sending the final drawings on to the contractor. Below are some of the progress shots I’ve taken during the process. Next week the cabinets are being delivered and installed. So that will be a big week in terms of progress. I will definitely be posting pictures on my stories. With that said, be sure to check out my instagram account (@laurenlcaron) for up-to-the moment updates, and my pinterest for my kitchen board to see where I drew my inspiration from. Social link icons are below for easy access!